Solid triple-milled shaving soap handmade in Italy by Saponificio Varesino. Scented with top notes of bergamot, blackcurrant and pineapple. Earn up to 32 Reward Points for this item. Special edition shaving soap made by Saponificio Varesino for the Cosmoprof 2018 Exhibition. The Opuntia shaving soap is a solid soap that is triple-milled using Saponificio Varesino’s Beta 4.3 formulation and includes the ingredient Opuntia Ficus-Indica (Prickly Pear Extract), which creates a protective film and deeply moisturises the skin. 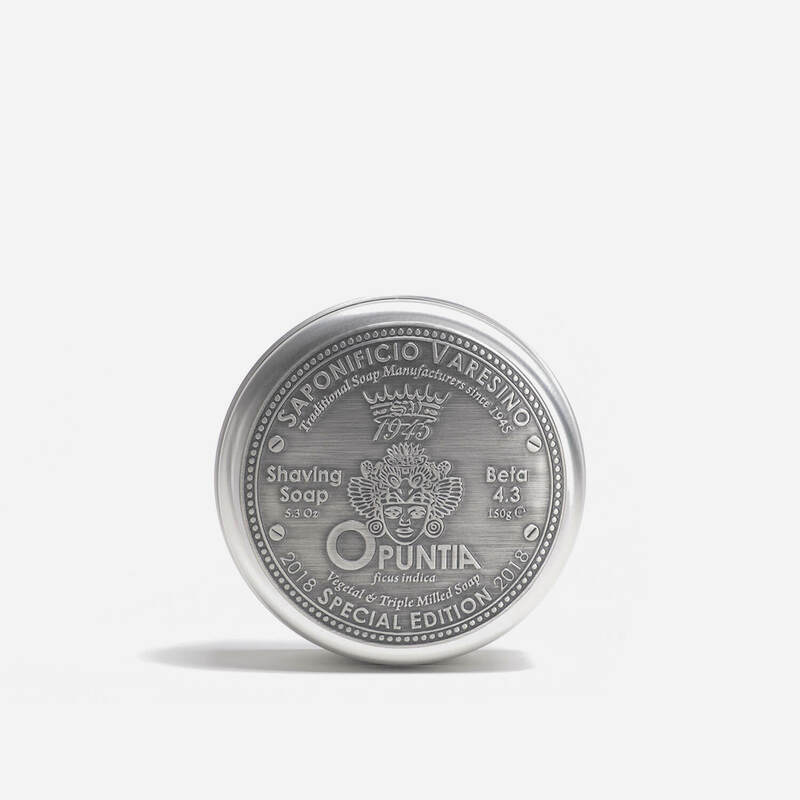 The soap is handmade in Italy and presented in an aluminium tin with a metallic embossed label. Soap Scent: top notes of bergamot, blackcurrant and pineapple, with base notes of white moss, oak moss, patchouli and vetiver. I have been wet shaving for years and about a year ago bought a Merkur DE adjustable razor. I tried different blades (ended up favouring Feather), soaps, creams, post shave balms, pre shave oils, scrubs etc I have been through many combinations from all the major high street brands from including L Occitane, Molton Brown, DR Harris, Clinique,Neals Yard etc. This is the best. Really creamy lather giving a smooth shave and moisturising really well. I have a strong beard and dry skin. Since using my skin has settled down really well and using the Saponificio after shave balm completes a great shave. No need for pre scrub or pre shave oil, just wash, lather, wait a bit then shave…. I don’t do reviews but this shaving soap is really good – will try their others in due course.